#MyFSN is a neighborhood campaign that celebrates the only historically preserved block in Little Tokyo through community-based arts, awareness and engagement. The campaign aims to highlight First Street North (FSN) as a block that is critical to the past and future of the Little Tokyo neighborhood, and to promote a community vision for FSN. The project is led by Little Tokyo Community Council, FSN stakeholders and LTSC (through +LAB). “Moving Day,” an outdoor public art installation and series of related public programs put on by the Japanese American National Museum, focusing on the exclusion orders used by the U.S. government during WWII to incarcerate thousands of people of Japanese descent. +LAB also contributed to LTSC’s 11th Annual Sake and Food Tasting event, held on July 21, 2017. 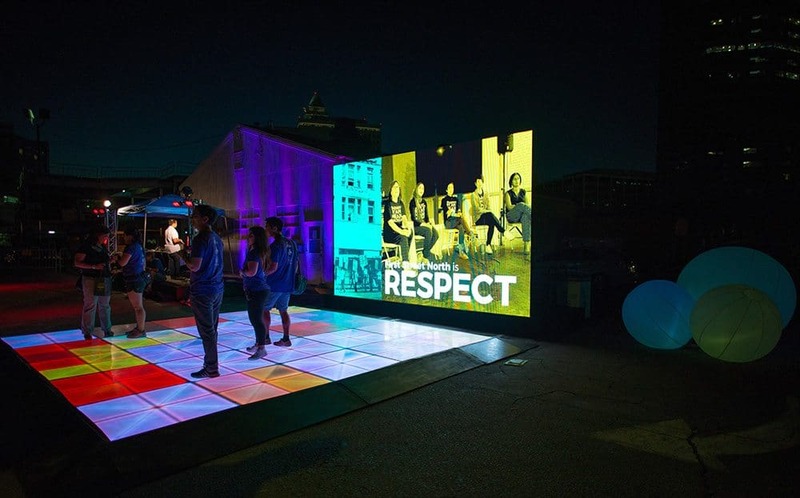 FSN was the site of the event, which was entitled “Sake at First Street North, Little Tokyo.” Drawing attention to the #MyFSN campaign, the event featured a multimedia installation, developed by +LAB, to inspire guests to re-imagine the First Street North block.